There is little doubt that today the spinning reel is more popular than the bait casting reel, and for good reason. It is easy to operate, backlash free, and after a little practice casting you are pretty much ready to go fishing. It is more difficult to learn to cast with a bait casting reel and backlashes (tangled line) will be frequent until you do. However, an expert can cast farther with a bait casting reel than with a spinning reel. 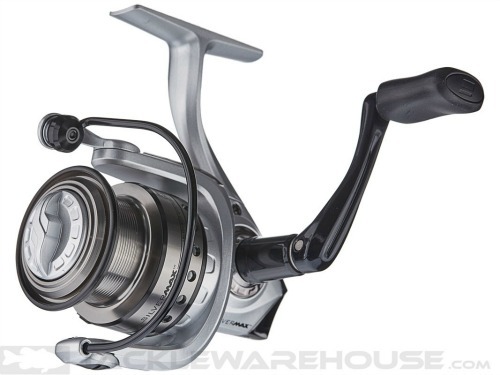 Abu Garcia Silver Max spinning reel. Photo courtesy of Tackle Warehouse. The axis of the spool is parallel to the rod and the spool remains stationary when casts are made, thus allowing the line to be pulled from the reel over the front edge of the spool. During the retrieve, a worm gear moves the spool forward and back as the handle is cranked. This movement ensures that the line is wound evenly back onto the spool by the rotating bail. The bail is a gear driven wire loop that circles the spool as the handle is turned and it winds the line on the spool. It is manually opened to free the line before the cast and closed automatically when the handle is turned to retrieve line. Catch the line with the index finger of your casting hand and open the bail with your free hand and cast. After the bait has hit the water, turn the handle far enough to close the bail with your free hand. The partial turn of the bail positions the line under the line roller that is incorporated into the bail to reduce friction as line is retrieved. All spinning reels incorporate a manually operated drag system that uses friction to adjust the amount of force necessary to pull line from the spool when the bail is closed. A properly adjusted drag is crucial on any fishing reel, because a drag set for too little resistance will allow a hooked fish to run too much line off of your reel. Conversely, trying to land a big fish with the drag set too tight could cause your line to snap, or in extreme cases could break your rod. The drag on a spinning reel is adjusted by turning the dial located in front of the spool. With the bail closed, simply pull the line between the reel and first line guide on the rod and turn the dial to adjust. The drag on any reel is properly adjusted when the rod bends the amount you want it to when fighting a fish, before line is stripped from the spool. Abu Garcia Silver Max bait casting reel. Photo courtesy of Tackle Warehouse. The bait casting reel is a completely different animal and for comparison to the spinning reel I will discuss the low profile bait caster. For starters, the bait caster reel has a steep learning curve and requires considerable patience. Each reel should come with a prescription for sedatives and yes, I speak from experience. Unlike the spinning reel, the bait caster is designed to mount on top of the rod with the rod line guides facing upwards. This means you must resist the pull of gravity to keep the rod and reel right side up, which is why bait casting rods often have contoured reel seats. You should not use a bait caster on a rod that is designed for a spinning reel or vice versa. Casting reels come in right hand retrieve or left hand retrieve models and the handle is permanently installed. Although there are varying opinions as to which hand should hold the rod and which hand should be used to operate the handle, conventional wisdom dictates the rod is held in the weak hand, which fights the fish, and the reel's handle is turned with the strong hand. This means that after the cast is made with the right hand the rod and reel must be transferred to the left hand for line retrieval. Personally, I find this counter intuitive. I am right handed. With a spinning reel I cast with my right hand and retrieve with my left. This provides the power of my strong hand and arm to set the hook and for fighting the fish. Reeling is a much easier task and better served by my left hand, so I opt for left hand retrieve bait casing reels. The axis of the spool in a bait casting reel sits perpendicular to the rod and the spool rotates as you cast and retrieve. Where the spinning reel moves in and out as the bail winds the line on to ensure that the line is evenly wound, the bait caster incorporates a level wind system, through which the line is fed, that moves the incoming line from side to side as the spool turns. The bane of bait casting reels are backlashes. This is essentially a bird's nest of line twisted around the spool when casting. Backlashes are caused by the spool turning faster than the line is going out and they jam the reel, making it inoperable until the tangles have been removed. Backlashes occur because the spool must spin at a fast rate when line is being pulled off by the bait during the initial part of a cast, but when the bait slows down due to air drag and then hits water, no more line is being pulled. Unfortunately, the spool (rotating on low friction bearings) continues to rapidly turn due to inertia. Unless the spool's rotation is slowed as the line slows during a cast and is stopped manually when the bait hits the water, it will continue to rotate, thus releasing line that is not being pulled through the rod guides. Think of backlash as overrun. Depending on your experience level, untangling a severe backlash is best described as frustration on steroids and has sometimes resulted in a rod and reel being pitched into the water, never to be seen again. I thought twice and threw mine into a bush. One way to prevent backlash episodes is through a technique called feathering. Feathering is simply placing your thumb on the spool to slow its rotation to match the rate at which the line is going out and stopping all rotation when the bait hits the water. This takes a lot of practice to learn. Another way is the position of the rod and reel when the cast is made. Hold the rod and reel out in front of you with the back of your thumb resting on the spool release (free spool) lever and the tip on the spool. At this point the axis of the spool should be parallel to the ground with your thump facing upwards. While maintaining your grip, simply rotate your hand 90 degrees to the left so the back of your hand faces upwards and the axis of the spool is perpendicular to the ground. Depress the release lever all the while maintaining pressure on the spool, keep your elbow at your side, bring back your hand and forearm to your shoulder and cast forward. Most modern low profile bait cast reels feature an internal, user adjustable, braking system to reduce backlashes. The first type uses an internal centrifugal brake consisting of spring loaded brakes that can be turned on or off. Access to the brakes is through a removable side plate that is located on the palm side of the reel. Some reel manufacturers use a four brake system and others may have six, but there is always an even number. According to Japan Tackle, the centrifugal brake system utilized in bait casting reels functions by applying the friction of the brake blocks against the brake ring. The brake force is proportional to the square of spool speed. Therefore, when the spool speed is fast, brake force is much stronger than when spin speed is slow. You might notice that centrifugal reels cast well even with slow casting speed, like pitching. This is because of the basic exponential shape and ineffective brake range near zero speed. However, you may also have noticed that when you cast harder and faster, the casting range does not change as much as expected. This is because the exponential brake force at higher speed strongly regulates the initial speed at which the spool is allowed to turn. Adjusting the centrifugal brakes is quite simple. If you decide to turn a brake on (or off) you should set the opposite brake in the same position. For example, with a four brake system you can have two on and two off, or have all of them on. I recommend having half on and half off, regardless of the number of the brakes. The other system is the magnetic brake that uses electromagnetic force, which occurs between magnets by moving metal close to the spool wall with a force almost directly proportional to the spool speed. The brake force is inversely proportional to the distance between the magnets and the spool. The magnet brake was the first brake system to use an external dial that changes the distance between the magnet and spool wall. It has wider adjusting range at middle speed, but has relatively too much brake at slow speed. The brake at high speed is less than a centrifugal system and a magnet brake allows higher initial spool speed. Adjusting the magnetic brake is also simple. On, or near the side plate will be a dial that controls the amount of magnetic force applied. Some manufacturers have 10 settings and others have more. I recommend setting the dial to its midway point, then fine tune as necessary. If this wasn't enough, there is one last thing and it's adjusting the spool tension. This is a large knob that is located near the handle and must be adjusted every time you change the weight of your bait. This is accomplished by reeling your bait to within an inch or two of the rod tip, hold the rod out in front of you at about 10 o'clock. Depress the spool release and watch the bait fall. Ideally, the bait should make a moderately slow descent until the bait hits the ground. If the bait drops too quickly you will see the beginning of a backlash. If this occurs, tighten the knob and repeat the process until there is no more backlash. The drag of a bait caster is either tightened or loosened by turning the star shaped adjuster located between the handle and the body of the reel. Turn the star forward to tighten the drag (increase spool friction as line is drawn out) and backwards to loosen. By now you are wondering why you would want to spend a huge amount of time and frustration learning to use a bait caster, when a spinning reel is so much easier. This is a reasonable question. With a bait caster there is not the hassle of catching the line with your finger, opening the bail, casting, closing the bail and then retrieving your line. When you are fishing for bass it is not unusual to cast 40 times or more each hour, so using a spinning reel can be tiring. However, the primary advantage of the bait caster can be summed up by two words, accuracy and control. Because you can more easily feather the spool, it is pretty easy to control exactly where your bait lands in a linear direction. In other words, if you judge that your cast is going to over-shoot your target, all you have to do is feather the spool. This makes it relatively easy to cast a bait close to a shore bank or structure where the bass live, or to completely terminate a bad cast that is headed for a tree limb. Although you can use your index finger to slow the line coming from a spinning reel, it is not as easy. An expert can cast farther with a casting reel than with a spinning reel. However, long distance casting requires a reel without the level wind feature, to reduce friction as the line is pulled out by the lure or bait. When retrieving, the incoming line must be guided by the thumb of the off hand to keep it evenly distributed (level) on the spool. This is easy to learn. The distance casting records are held by anglers using revolving spool reels with magnetic, or no, spool braking system. This is because the casting reel's revolving reel can be used to "shoot" the line from the spool, a technique used by experts to increase casting distance. If you turn the handle of a spinning reel when a fish is running (or if for any reason the line is not coming in), the spinning bail twists the line. Twisted line quickly becomes a problem and will create a tangle similar to a backlash. If you turn the handle of a casting reel when a fish is running, the spool doesn't turn, but no harm is done. For freshwater bass fishing, my preference is the low profile bait casting reel. Once its use is learned, its advantages outweigh its disadvantages. Copyright 2017 by Barr H. Soltis and/or chuckhawks.com. All rights reserved.